January 2018: Michael Wignall departs Gidleigh Park after two years with plans to launch his own solo venture. He is replaced by former Restaurant Nathan Outlaw head chef Chris Simpson. “Michael Wignall’s has perhaps even surpassed Michael Caines” at this famous culinary Shangri-La – a “special” Tudorbethan manor house in the narrow back-lanes bordering Dartmoor (“if your looking for a special foodie break, then this is just the place”). 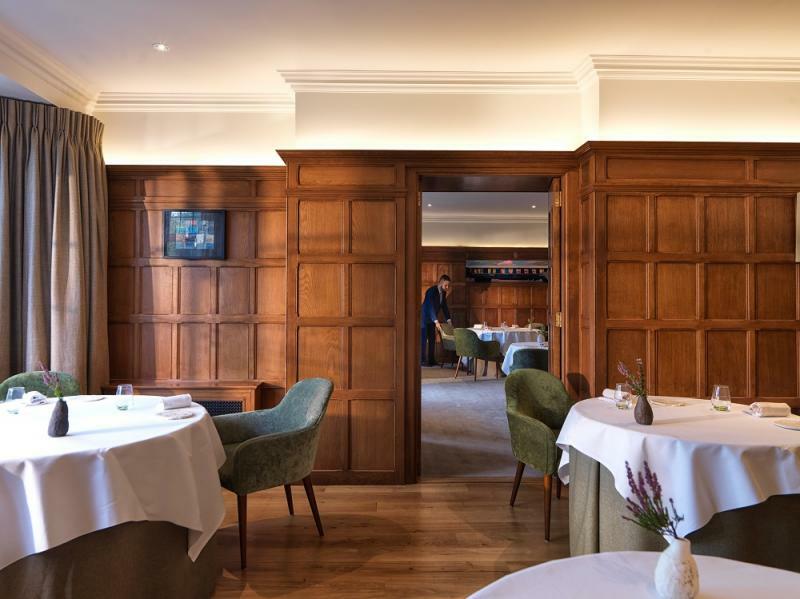 “The exceptional tasting menus top anything the chef formerly produced at Pennyhill Park, with a magnificent balance of tastes and textures” (“sound absurd but marry perfectly”), and “the intelligent sequencing of dishes” helps create “a sensational gastronomic treat”. There’s “a marvellous wine list” too and “top class service”. “After a meal you can sink into comfortable chairs in the plush lounge for coffee and then wander around the beautiful grounds: as an all-round experience, it’s hard to beat”. “Obviously everyone was nervous about the departure of Michael Caines, but fear not!” – “Michael Wignall is off to a fine start” at this famous Tudorbethan manor house discovered “after a terrifying drive up a narrow lane” on the fringes of Dartmoor. Once ensconced, there’s the chance to “relax in the beautiful lounge and enjoy a warm welcome” amidst a setting of “country sophistication”, before moving onto the main event in the dining room. The new kitchen’s output is “utterly amazing – so quirky and gorgeous” and backed up by an “exceptional wine list”. “I don’t think as a package it can be bettered in the UK!” – this “luxurious yet understated” Tudorbethan manor set amidst “wonderful garden and grounds” in a fairly remote corner of Dartmoor is a culinary Xanadu that’s long been a mainstay of the survey’s Top-10 UK Restaurants (No. 6 this year). Michael Caines's “sumptuous” cuisine – “traditional yet tweaked with a modern edge” – is a “pure indulgence” (“like a team of magicians have been at work in the kitchen!”) and backed up by a particularly impressive cellar. In mid-2015 he announced that he would start stepping gradually back from the kitchen here to open his own hotel in Lympstone in early-2017 – The Latymer's Michael Wignall will succeed him. Have you eaten at Gidleigh Park? The elegant and intimate restaurant provides a sophisticated backdrop for new Executive Chef, Chris Simpson to debut his new menus. Chris arrived at Gidleigh Park in January 2018. Having held the position of Head Chef at Restaurant Nathan Outlaw for seven years, which has held two Michelin stars since 2011, Chris enjoys a reputation for outstanding cooking with the very best of local ingredients. His menus are carefully crafted without pretension, and his food is defined by the absolute freshness & seasonality of ingredients alongside true clarity of flavour. Chris is originally from Barrowford in Lancashire and started his cooking career with Nigel Howarth at Northcote Manor. Chris stayed with Nigel for three years and much of his love of local ingredients and classical cooking started there. He then spent time travelling in Australia, working with a range of restaurants and cooking styles to further his learning, Chris also built his experience at Michelin-star restaurants in the Netherlands at FG in Rotterdam, as well as at The Vineyard in Berkshire, and Restaurant Martin Wishart in Edinburgh. His first role with Nathan Outlaw was at his very first solo venture The Black Pig and culminated in a 17 year association with Nathan and seven years as his Head Chef at Restaurant Nathan Outlaw which gained two Michelin stars in 2011 and was voted as the number one restaurant in the renowned ‘Good Food Guide’ shortly before Chris took up the reins at Gidleigh Park in 2018. Menus are carefully crafted without pretension, and his food is defined by the absolute freshness & seasonality of ingredients alongside true clarity of flavour. Chris enjoys experimenting with ingredients, exploring how to bring out the best in them and building flavour combinations and one ingredient can be the inspiration for an entire dish. His dishes are designed to take advantage of the area’s best produce cooked to maximise flavours with a refined yet apparently simple, honest approach. Reviews of Gidleigh Park Restaurant in TQ13, Chagford by users of Hardens.com. Also see the editors review of Gidleigh Park restaurant. "Excellent wines by the glass suggested by the Operations Manager, the Ex head Sommelier"
"It was intriguing to find Chris Simpson at the helm here as we have known his qualities for some years in his previous guise as head chef for Nathan Outlaw, and we were curious to see how he would impose his style, not only on the Gidleigh Park experience but also on a menu that is not exclusively fish based. The welcome was classic with all the professional and friendly ease expected of this venue and canapés were served with champagne in the warm lounge - superb crab soup with fennel, not unlike the Porthilly sauce from Cornwall, and smooth creamy smoked fish with caviar giving us an immediate sense of satisfaction and an idea of the treats to come. In the smallish dining room, much less traditional than we remembered, we were greeted by a subtle mix of an amuse-bouche of Salcombe Bay crab tart with pickled apple and Hollandaise sauce with caviar which led into the first course where pickled shimiji mushrooms and a rich mushroom cream highlighted some fantastic veal sweetbreads with their comforting sourdough crumb coating. This was followed by excellent lemon sole fillet tempura, brown shrimps and a really classy basil emulsion which, happily, was in perfect balance with the fish. We were not entirely convinced by the pickled celery however. It seems that air miles don’t count when the best product comes from another country, and when it is in the form of Anjou squab this can be seen as perfectly acceptable with the flavour and texture of the bird absolutely top-notch with its bacon crumb coating and very well matched by parsnips and cream, and some really mild onion. Chef has oceans of experience with Cornish turbot and it showed here with the beautiful fish accompanied by a delicious lemon and nutmeg sauce with a touch of cayenne which gradually crept up on the palate in the most delightful way and was cleverly balanced by the lightly pickled turnip disks. The main was Cumbrian beef fillet, salt chamber aged, which we found less successful than the earlier dishes, and we wondered whether the potato terrine might have been reheated. The ox tongue accompaniment was very good though. The two desserts brought the meal to a fitting close - the first a lovely blackberry panna cotta with LBV port jelly, and an outstanding Granny Smith sorbet, which in a way made this a subtle palate cleanser as well as a dessert, and the second a warm chocolate tart with absolutely wonderful pastry covered with roasted and salted pistachio nuts and contrasted with a delectable yoghurt sorbet. This was top class cuisine with no need for trendy gimmicks to give the diner an excellent dining experience. Well done chef!" Post your own review of Gidleigh Park and contribute to our annual restaurant review guide.